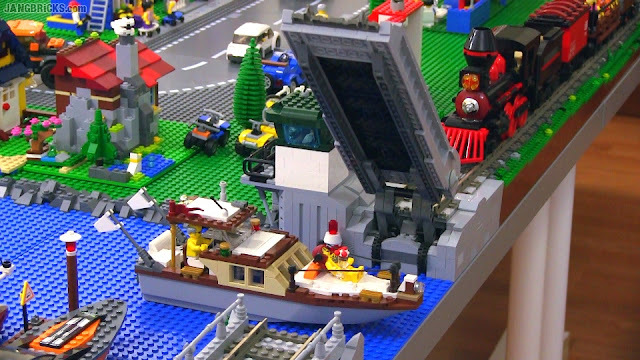 Working LEGO train drawbridge MOC complete! Well, it took me long enough to get this done, now didn't it? At least I'm satisfied with the result. My biggest fear was that the electrical connections wouldn't successfully complete with all of the mechanisms installed, but much to my relief, the first 9V train I ran around the loop (ever!) made it past without even a slight stutter. Finally I can wake up my beloved train fleet, and perhaps even start adding to it once again! Can you show the blue double cargo train going around? You could try to make at the non motorized end some lever and gears which will pull the bridge down completely. Second solution: bridge motorized at both ends going all up and down or a bridge which opens not up, but to the side (swing to the side).